Equine recurrent uveitis (ERU) is also known as â€œperiodic ophthalmiaâ€� and â€œmoon blindnessâ€�. Uveitis means inflammation of the iris and deeper structures inside the eye. ERU is the most common cause of vision deficits or blindness in the horse. ERU is characterized by multiple episodes of â€œactiveâ€� uveitis alternating with periods when the eye is â€œquietâ€�, or not inflamed. One or both eyes may be involved in the disease. Chronic ERU may result in partial or complete loss of vision. Signs of â€œactiveâ€� ERU include tearing, squinting, eye pain, sensitivity to light, and a cloudy or red eye. The active episodes of ERU cause permanent changes in the eye, including scarring of parts of the eye and possibly cataracts or retinal detachments. These permanent changes can be seen by a veterinary ophthalmologist even during the â€œquietâ€� stages of the disease. During the â€œquietâ€� stages, the eye is not painful and inflammation is minimal. ERU is caused by an overly active immune response of the eye to many different sources. The source may be bacterial (such as Leptospira, Brucella, Salmonella, or Streptococcus), viral, parasitic (such as Onchocerca, Strongylus, or Toxoplasma), or fungal. Trauma to the eye or certain diseases of the body can also be sources of ERU. It is important to remember that the source only initiates ERU. The original source may be treated or may go away, but the horseâ€™s own immune system may perpetuate the inflammation and disease in the eye. Relapses of inflammation may continue to occur although the original source of inflammation is no longer there. Identifying the original source of inflammation may prove to be very difficult, and in many cases, the causative agent or original source of inflammation is never identified. There is likely also a genetic predisposition to ERU as some breeds, such as Appaloosas, which have a higher incidence of the disease. Treatment of ERU alleviates the pain associated with the â€œactiveâ€� stages of the disease and decreases inflammation in the eye, with every attempt made to preserve vision. Medications should be prescribed by the veterinarian as soon as signs of ERU are noted. For each â€œactiveâ€� stage of the disease, it may be necessary to continue treatment of the eye for several weeks to several months, depending on the severity of inflammation. Although most treatment involves a combination of topical eye drops/ointment and oral or injectable medications, some patients may be candidates for a surgical implant device that slowly releases an immunomodulatory medication, cyclosporine. 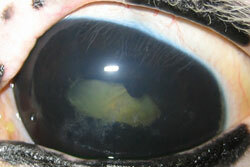 Relapses of inflammation of the eye require reinstatement of topical and systemic treatment by the veterinarian. It is important to contact your veterinarian or veterinary ophthalmologist if you feel your horse is having a recurrence of ERU. Signs of ERU can be similar to other conditions such as glaucoma or corneal ulceration and some of the medications used to treat ERU may be contraindicated for these conditions. Thus, it is important that you consult your veterinarian or veterinary ophthalmologist prior to restarting medications for ERU. It is also important that you contact your veterinary ophthalmologist prior to stopping or decreasing the frequency of any prescribed medications. It is helpful to keep the horse in a darkened stall with limited exercise during treatment periods. If treatment fails and the eye becomes blind and painful, the eye may need to be removed to eliminate discomfort. The prognosis for vision in horses affected with ERU can be poor. Prompt treatment may slow or prevent the occurrence of blindness.